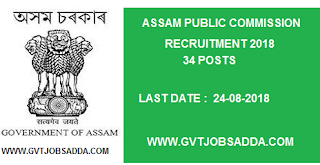 Assam public service commission has recently published employment notifications for the Assam finance service(in cadre or finance and account officer/Treasury officer/class I and grade II Vacancies. Those Candidates who are interested in the vacancy details & completed all eligibility criteria can read the Notification & Apply. For more detailed information about Education Qualification in Assam Public Service Commission Recruitment candidates check the official notification. thank you for this articale i like it.